There have been changes for other regions, as well, and you can check them out on the software upgrade page, here. Motorola also added the following disclaimer to the page: "If your Android 1.5 ("Cupcake") through Android 2.3 ("Gingerbread") model is not listed here, it is not slated for any further Android operating system upgrades." This time, it doesn't look like any US device that was in 4.0-limbo has been removed from update purgatory, with the XOOM Family Edition and Xyboard 8.2 / 10.1 tablets still seemingly undecided on 4.1 upgrade eligibility. 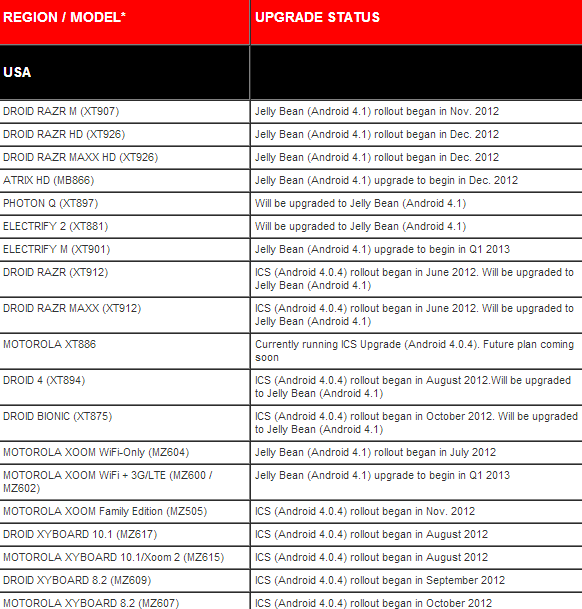 Say what you will about Moto - they have the clearest device update eligibility tool of any OEM. Let's hope the speed and quality of the updates start to live up to that page now that Google's at the helm.